Mehran Tehrani, an assistant professor of mechanical engineering at The University of New Mexico, has been awarded a National Science Foundation (NSF) CAREER Award to develop new materials that are ductile yet strong. Such material has potential for revolutionizing the energy, defense, and transportation industries and can help save billions of dollars a year in failure and inspection costs, he said. 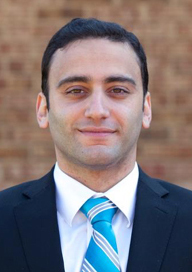 The award, which begins June 1 and continues through May 31, 2024, provides Tehrani with $500,000 for his project, called “Mechanical Behavior of Graphene-Carbon Fiber Composites.” It is his second early-career award, the first of which was the Office of Naval Research Young Investigator award last year. The NSF CAREER program is geared toward helping early-career faculty get strong starts on their academic careers. The award is NSF’s most prestigious award in support of junior faculty who exemplify the role of teacher-scholars through outstanding research, excellent education, and the integration of education and research within the community. Tehrani said the project would be a continuation of the research he conducts on materials and the ever-present problem of how when materials become stronger, they become more brittle. For instance, carbon fiber-reinforced composites are one of the strongest materials known, but they are also very brittle and break under only 2 percent stretching, he said. He said great promise exists in developing new materials with graphene, which when mixed with other materials, can impart enhanced functionalities, such as shielding from corrosion, oxidation and high temperatures. Currently, major structural materials for the defense, energy, and transportation industries are polymer-matrix composites, which have several limitations, including poor damage tolerance and a brittle performance, resulting in catastrophic failures. Tehrani hopes that the graphene-based materials will remove these limitations while achieving the strength and stiffness of polymer-matrix composites. Although the NSF project is basic science, Tehrani said the ultimate goal of the project is to improve the functionality and durability of materials for the military, space, energy, health care and many other applications. During the five-year project, he also will be working with local K-12 schools to develop programs to interest especially underrepresented students from Hispanic and Native American communities and females in the areas of nanotechnology. Tehrani said the NSF CAREER award is, of course, a great boost to his research career, but he feels it is even more meaningful because it also focuses on sharing the knowledge he gains through the focus on K-12 student recruitment. “It gives us funds to be a pioneer in our field of research, as well as to become an academic role model in education by integrating research with our teaching and outreach,” he said. In 2018, Tehrani was awarded another early career faculty award, the Office of Naval Research Young Investigator. He was one of around 30 who were selected out of 340 applicants to receive this award. The title of Tehrani’s project is "Next Generation Electrical Wires for Navy Applications." It seeks to fundamentally understand the effects of combining graphene and other nanocarbons with metals toward the development of advanced cables, to significantly reduce weight and increase performance efficiencies for various energy system applications.